Edit Game Settings and add/remove game balancing perks dynamically in game through a convenient MCM menu, and much much more! Housecleaning on old, unused records. Added 8 new vendor gold sliders. These sliders require Grimy Plugin Version 1.10. Updated descriptions for experience skill use options. Updated descriptions for item limiter. Updated formatting for global int text inputs. torch sliders will default correctly. First and Third Person FOV options were flipped. This has been fixed. Essential NPCs take damage defaults correctly. New INI Toggle, essential NPC's take damage. Fixed display for NPC armor rating scaling. Changed slider mode back on to default because people can't seem to install grimy plugin X_X. Added two options for player and NPC armor rating scaling. Added INI option for letting skyrim run in the background. Added INI option for disabling VATS kill cams. Removed Grimy Plugin as a prepackaged plugin. It was confusing MO, please download and install Grimy Plugin separately. I messed up the onselect options in the last update, that was fixed. Changed text input options to be the default now. Text input options now parse to a relevant number of decimal places. Grimy Plugins version updated to 1.03. Added Torch Radius and Duration Sliders to the MISC section. This will only affect normal torches, not every type of torch in the game. Small change to my modified SkyUILib file. This should fix some hotkey issues. Updated my modified SkyUILib to avoid screen freeze issues. The save button in the MCM menu now uses text input. Added new option to use text input instead of sliders. Updated SkyUI Requirement to version 5.1. Updated my SkyUILib script. No direct impact on SkyTweak, but it will prevent compatibility concerns with Grimy Utilities and GUISE. Removed the global FISS load feature from SkyTweak, and the relevant iHUD/SkyUI Patches. Added option to disable save/load messages. save hotkey options are included in the FISS presets. Descriptions for AI Search Time and AI Search Time Attacked were flipped, this has been fixed. Added INI sliders for world map rotation and min height. Added a warning for all you sillies who keep loading old XML's into SkyTweak. Removed 3rd Person Bolt Tilt. The uesp claimed it existed, but my papyrus log claims it does not exist. Shout scaling no longer affects the slow time shout. Fixed a typo with the INI toggle tutorials option. Added INI option to toggle tutorials. Added new script for gaining armor/block experience for just being in combat. Merged the SkyUI Player load script into one of SkyTweak's. Added a separate global preset load button. Currently affects Grimy Utilities and nothing else. I'll be adding support for this feature in the future. Fixed an issue where the alias would not attach properly. Reduced the number of notifications. Minor optimization to SkyTweak's loading procedure. Updated to a modified version of SkyUILib. Added scroll magnitude and duration sliders. Added 12 new potion/poison related sliders. Added the SkyTweakLoadEvent mod event. Enemy Armor Scaling will now double your physical damage output to compensate for the armor increase enemies receive. New Toggle: Enable Havok Hit -> Which allows your hits to cause some havok recoil on the target's model. New Slider: Havok Hit Mult, which determines how much force your havok hits cause. Experience sliders work off skill use mults now. If updating to 6.19 from a previous version, set all experience sliders to 1.0 before updating. Carry Weight slider goes up to 10,000 now. Added 2 Field of View sliders to the INI page. Added 2 Mouse sensitivity sliders for the X and Y axis to the INI page. Added slider for # of autosave slots to the INI page. Added 3 toggle options to hide the compass, disable depth of field blur, and disable gore to the INI page. Added new INI page, that handles changes to settings in the Skyrim.ini and SkyrimPrefs.ini files. Added magic cost mult and scaling sliders for NPCs. Split up the services section into a Vendors and Crafting section. Added damage dealt/taken as werewolf sliders. Added a third save hotkey option, which is to use auto save slots. Non-persistent Actor values now display their base values in the highlight description. Removed the prepackaged xml file, since I think most users should be set now, and I don't want to be accidentally overwriting their existing xml's when they update from nexus. Settings local to SkyTweak were not resetting in the full reset. I'm changing that. This wasn't a bug, just how I previously implemented it. Changing the implementation of Damage Taken/Dealt Scaling to work through core gamesettings instead of through a perk. Fixed the sneak mult slider. Added an option to make the save hotkey a quicksave hotkey, that doesn't ask you for the name of a file. 1H and 2H sneak mults were flipped, this was corrected. Trap Magnitude, and a number of perk related sliders were not displaying properly. This was corrected. Altered the implementation of Damage Taken/Dealt sliders to work better with some new features I'm planning for GELO and Vile Concoctions. IMPORTANT FIX. A number of sliders were not loading the correct values at the start of the game. Slider range on Buy and sell price mults can now go down to 0. Removed the save hotkey notification. Thought it was too annoying. 2 New Sliders: Damage Dealt/Taken that scales with player level. You can now cancel a save you have queued. Split the save game and exit game buttons. Changed some actor values to display and edit only the base values. Added save and exit options. SkyTweak is scanner is significantly less vigilant. The save and exit option should be a more reliable way to prevent rollbacks. SkyUILib is a requirement now. You can now name your FISS xml file. Just a version for playtesters to help me bugshoot some issues. FISS is a requirement now. Semantic changes to various sliders. Version 6.0 is a rebuild of SkyTweak's core code, from scratch. Added a mod event to allow other modders to ping SkyTweak for settings scans. Fixed an issue where sneak fatigue would not work if set to 6 stamina/second. Illusion Duration Scaling with target level got unbound and wasn't working in a previous update. This has been fixed. Added an option to load from FISS, to avoid rollback issues caused by script heavy mods causing the game to delete SkyTweak's memory. this option will not dynamically scan the game periodically, and will take longer to load at the start of the game. BowSpeedBonus had a typo preventing it from working, this has been fixed. Deleted a duplicate BowStaggerBonus entry. Redid many perk based options to be lighter and more flexible. SkyTweak no longer updates your default options. It was adding too much unnecessary complexity. To reset your defaults, create a new game, save to xml, then load that new xml. A new implementation of the bug fix from 5.1 has been implemented. It is (hopefully) lighter weight. Awaiting feedback to see if it works properly. Fixed an issue caused in 5.1, where "SkyTweak has Loaded" messages will pop up every time you open and close your menus. Fixed a MAJOR issue that caused settings to seemingly not load. Added an option to disable loading notifications. Added 2 sliders that determine your movement speed based on the weight of your equipped armor. Bleedout script now properly restores your lives after you sleep. The legendary bonus fixed to affect enchanting properly. Removed the NPC Stagger Script. Added the Melee Stagger Script. May have fixed a bug where certain settings would reset on game load. Fixed Non-persistent actor value sliders. Legendary Bonus's increase in heavy and light armor power mods should actually affect armor ratings now. Renamed a bunch of scripts to be more consistent, so deactivate your scripts before this update. Ran my option descriptions through MS Word and fixed the typos. Perk slider is now capped at 255 instead of 300 for reasons now obvious to me. The save hotkey will now properly register on game load. Rune and max summon caps raised from 10 to 100. Changed the dragon shout scaling from a toggle to a slider. Changed the save hotkey delay from 3 seconds to 1 second. Added a save hotkey option, that will not suffer from the rollback issue. Player Stagger Script: Cloaks will no longer cause stagger. Player Stagger Script: Weapons were dealing 15x longer stagger duration than intended. Player Stagger Script: Added extra layers of movement re-enablement checks for the rare cases where papyrus skips code. Player Stagger Script: Explosions no longer cause stagger unless a hostile spell is attached to the explosion. The actor value change in version 3.7 was causing non-persistent AV's to load incorrectly, this has been fixed. Fixed a typo in fCameraShakeTime to make it work again. Updated the Player Stagger script to account for if the player isn't wearing an item. Changed actor values to work based on total AV instead of base AV. Should be a bit more intuitive. Fixed a typo that caused players to be staggered for longer while wearing heavy armor instead of for less time. Made some changes to the wording in the highlight descriptions. Carry weight was incorrectly flagged as persistent, and wasn't updating properly as a result. This has been fixed. Added a separate page for Scripts and moved relevant tweaks into that page. the Player Stagger module has been fully fleshed out. A rudimentary NPC stagger module has been added, it will be fleshed out later. Added a warning message for script related options. added a timed block feature. Even more description tags have been added to setting descriptions. The Stagger Taken slider has been given more depth. Added yet another layer of compatibility scans to the console commands menu. Added yet another layer of compatibility scans to the System Tab Menu. Moved a layer of compatibility checks from OnPageRest over to OnConfigOpen. Added fast travel speed mult slider. Added HUD Compass Max Distance slider. Gamesettings will be re-evaluated each time you open the game menu, improving compatibility with more mods. Namely Stealth Skills Rebalanced. Critical Hit Damage and Bleeding Damage Scaling now account for alchemy boosts, as well as enchantments, perks, and skill level. Complete rework of both the attribute and actor value sections. Lots of sliders and new options. Perk buttons have been replaced with a slider. Compressed the code by ~0.75x. Trap magnitude slider now affects dart traps and weapon based traps. Added max attached arrows slider. Added a trap magnitude slider. Added two potion/poison magnitude sliders. Added two sliders for damage reduction from blocking with a weapon and shield. Event magic effects are now hidden in UI. Edited the Stagger on self mechanics, it will still need more work though. Increased XP sliders to go up to 2.0x. Fixed the 6 friend/ally hit sliders. SkyTweak will now import your mod settings on each load, instead of just once. Removed 8 sliders that had or no longer have impact on the game. Reset buttons have merged into one. Updated all the options in all but 1 page into sliders. There also a slider for Arrow Famine and Sneak Fatigue. Arrow Recovery Chance is now a new option slider, and no longer tied to arrow famine. Telekinesis Dual Mult has been reintroduced. Potion and Enchant Gold Mult have been removed as they did nothing. Legendary difficulty sliders have been added. Added 8 new Sneak Multiplier sliders. Added sell and buy price sliders. Added a vendor respawn time slider. Updated AV modifiers to work based off of base actor values. Add/Remove Perk Points moved to the Misc page. Added 5 level scaling option sliders. Added two toggle options for friendly fire damage and stagger. Added a sound for clicking text options. WARNING version 1.5's loader is broken! It will not automatically reload your previous settings. Fixed some more typos with difficulty sliders. Hardcoded the pagelist to fix the issue where pagelists sometimes will not load. Sneak Spell Mult only affects destruction. Added another autosave option called "Used regular save slot". Fixed a typo in a description. SkyTweak is an in game menu with literally hundreds of game balancing options. When you slap a bunch of gameplay mods together, the end result is almost never going to be balanced. SkyTweak fixes that for you, and often flat out replaces many smaller mods. Check out the articles page for a list of features. Note that the screenshots are a few years late. FISS is a tool that lets me save data to an XML file. Which in turn gives you the ability to transfer SkyTweak settings in between save files. Without it you have to redo your SkyTweak settings every new game you start. SkyTweak uses a modified version of SkyUILib. This is prepackaged. MCM menu mods may not appear if you put them beyond the 127th mod slot. None of SkyTweak is hardcoded, so it has essentially no compatibility issues with other mods. SkyTweak edits settings via script when you load a save file. This means SkyTweak can and will override settings from other mods. Do NOT bash SkyTweak, or run SkyTweak through SkyProc. It might not hurt, but there's definitely zero need. It could only cause trouble. However, SkyTweak's settings will be identical to that of your load order until you make changes. Additionally, you may use the re-import option to tell SkyTweak to scan the settings of your load order once again. 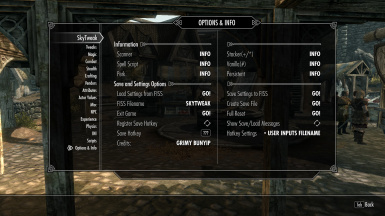 If you run mods that change gamesettings dynamically over the course of the game, you will want to use SkyTweak's "Save and Exit" options to exit the game, instead of exiting in a traditional way. This will give SkyTweak time to record the updated settings before exiting. It is possible for SkyTweak to rollback your settings if a mod changes these settings dynamically throughout the course of the game. To prevent these rollbacks, save the game using the save and exit buttons in SkyTweak, instead of exiting normally. This will allow SkyTweak to record your settings before exiting, preventing a Rollback. This happens when you import a FISS file that doesn't exist or was from an old (5.8 or earlier) version of SkyTweak. Use the Re-Import option to reset everything back to defaults or just correctly import a FISS file. There's a guide on how to deal with this in the articles page. This mod event will instruct SkyTweak to scan for changes in settings. If you have a mod that updates gamesettings dynamically throughout the course of the game, and you implement these pings correctly, you can circumvent the need for users to exit the game with SkyTweak's save and exit features.